Incorporating silver nanoparticles / microparticles into polymers forms antimicrobial films that can be used in many medical technologies. Silver ions are released from elemental silver in the presence of oxygen and water. These silver ions can break down cells walls, inhibit cell reproduction and disturb metabolism within a microbe. This property can be utilised to treat wounds and burns as well as infections like MRSA and E.Coli. To prepare a PVC film with small silver particles, silver nitrate is added in the preparation of the PVC film. A film with large holes is required so plasticizer must be added. The silver nitrate is then reduced using sodium citrate, leaving dispersed silver particles throughout the film. Hotplate, magnetic stirrer, 75ml beaker(s), graduated cylinder, Pasteur pipette, spatula. Prepare 20ml solution of PVC (see Activity 2.5) with 2.5 mL of the plasticiser di-butyl sebacate. While the PVC is still in solution, add 2.5 mL of 10mM silver nitrate (AgNO3) and stir with the magnetic stirrer for 1-2 minutes. Divide the solution over two 75ml beakers. Quickly rotate each beaker so that the whole inside of the beaker is coated with the solution creating a film in the shape of a beaker. Ensure that there are no gaps as the film must be capable of holding water. Allow the solvent to evaporate off and when dry, carefully remove the film from the beaker. Make up a 5mM solution of sodium citrate and pour this into the beaker shaped membrane, allowing it to pass through the membrane and react with the silver nitrate to form silver nano/microparticles. Note the colour changes to the membrane. 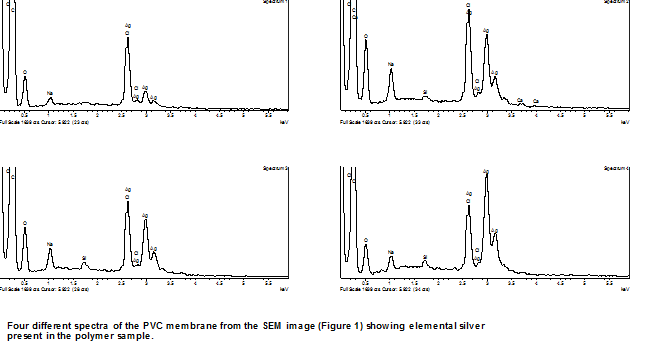 Allow the film to dry off in a fume hood and analyse it under a SEM to see if any elemental silver has formed. 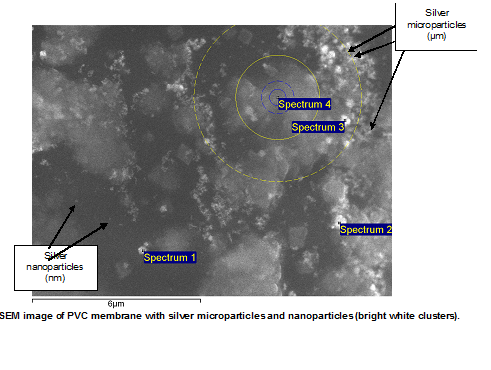 The SEM images below show the Ag particles dispersed in the PVC membrane. The antimicrobial properties of this film can be tested by placing a piece on an agar plate and leaving the plate in good conditions for microbial growth. An area of no growth will be observed close to the film. Potential applications of these films can be discussed in environmental and medical areas.